Standoffish | News and Features | Style Weekly - Richmond, VA local news, arts, and events. After more than a month, the Occupy Richmond protest is gaining steam. Last week, protestors first circled Monroe Park as a diversion, and then moved to Festival Park at the Richmond Coliseum. While a jubilant throng of Occupy Richmond protesters discusses tactics inside Festival Park, Richmond’s Chief Administrative Officer Byron Marshall whispers into his cell phone and Police Chief Bryan T. Norwood huddles with his lieutenants near a long line of police cruisers. Two weeks after the occupiers’ ouster from Kanawha Plaza, Occupy Richmond’s cat-and-mouse game has reached a critical stalemate. Police surround the park in front of the Richmond Coliseum shortly after midnight, and later warn about 200 or so young protesters that they have a couple of hours to evacuate. If they weren’t before, the angry, mostly 20-something participants in Occupy Richmond are on the political radar of Mayor Dwight Jones. That’s perhaps what’s been lost in all of the commotion about what to do with the increasingly savvy protest, which so far has centered mostly on a city ordinance barring camping in public parks. Political change is one of Occupy Richmond’s admittedly evolving goals, protesters say, and it’s led to uneasiness at City Hall about how aggressively to handle the group’s roving encampments. But the questions are getting serious: Can a movement that runs on disillusionment with the political establishment actually have an affect on it? Moreover, does this constituency as a whole wield any real political power in Richmond? The latest census figures put the number of Richmond residents ages 20 to 34 at 62,115. That’s 30 percent of the city’s population of 204,214 people. Attempts to brand Richmond as a destination for creative people are designed to grow that number even further. 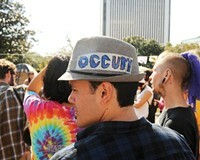 Seemingly, Occupy Richmond represents the more progressive, frustrated and politically active members of that group. But its traction is undeniable. What Occupy has created isn’t a small tent, either. Anyone frustrated by corporate power, economic disparity and the political process can find a home under it. Last week’s march through downtown is the group’s strongest showing. Inside Festival Park is a cross-section of the city’s activist population. Security-minded anarchists and other radicals with asymmetrical haircuts check the park perimeter to watch for police. In the center of the park, college-age activists, bundled up in jackets and hoodies, sit on the grass discussing next steps. Thad Williamson, associate professor at the Jepson School of Leadership Studies at the University of Richmond, says local universities have done a banner job of generating a steady stream of politically aware graduates who are committed to the city. “But it’s not proven yet that this grouping can have any mass influence, even on a council election,” he says. The geography of the city would seem to preclude their having an effect. Most of the city’s young people are concentrated into the 2nd and 6th City Council districts, both of which are home to large numbers of Virginia Commonwealth University students. But Occupy by nature is an outsider movement, and its members are loathe to work through the traditional political channels for fear of being compromised. Given that the movement’s goals remain vague, the wariness by politicians to reach out may be understandable. 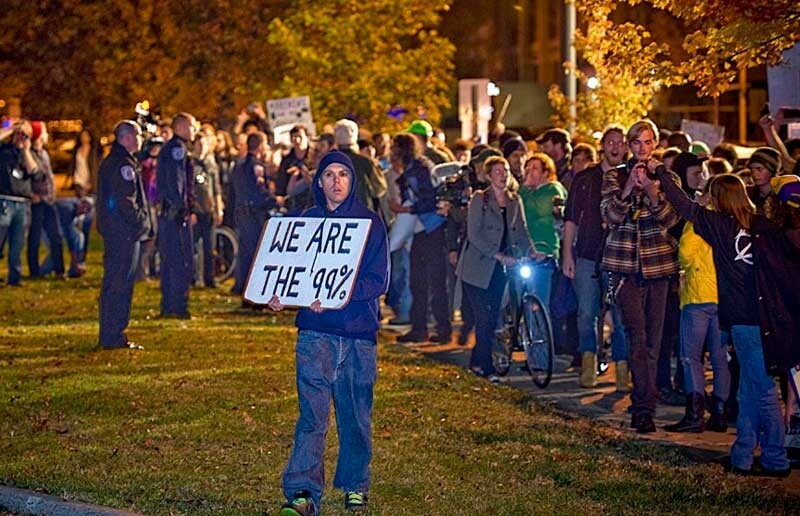 Weeks after its formation, Occupy Richmond has yet to issue a clear statement of its intentions. Will Carino, a member of the group’s media team, says that political change remains the movement’s goal. “But we’re not interested in aligning with any political party or ideology,” he says. In terms of future local elections, Carino says that protesters will focus on voter knowledge. “We want to educate them on the issues so that people are more aware of the issues and who and what they’re voting for,” he says.